Seasonal festivities that call for eggs often mean dye-coloured fingers and more hardboiled eggs than even reasonable people can eat in a weekend. I’d say that’s for the birds, or rather, the birds have a better idea for us. 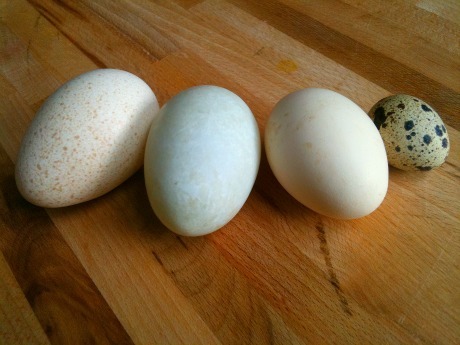 Instead of colouring plain old chicken eggs, why not seek out an eggy alternative? From left to right in the photo are turkey, duck, chicken and quail eggs, each lovely (and tasty) in their own way, and all of which make for a more natural approach to those psychedelic oeufs. If you want to eat them, by all means, you should. They’re all, well, eggy tasting–expect a lighter flavour from the quail eggs, and a heavier taste from the turkey and duck. I prefer eating eggs from my own happy chickens, but if you’re not lucky enough to live somewhere that lets you have a backyard flock, at the very least look for free-range eggs–better yet if they’re organic, but since my chickens don’t always eat organic (they’ve been known to enjoy all sorts of table scraps), well, who am I to say? Look for duck eggs at your local farmers’ market, and expect a richer egg than you’d get from chickens, as duck eggs are to chicken eggs what whipping cream is to whole milk, with a deeper flavour and enormous yolks. Turkey eggs are harder to come by–I have a farm connection, but you might sweet-talk your favourite free-range turkey farmer into sparing a few eggs for your seasonal table. 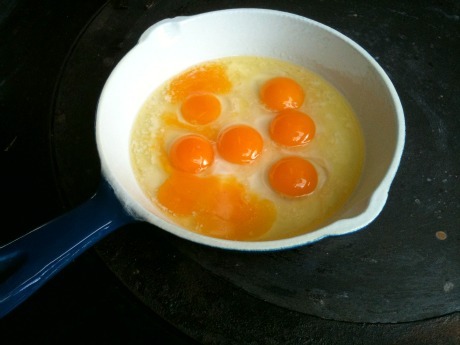 Two is plenty for a small omelette, and again, they’re richer than chicken eggs by far. 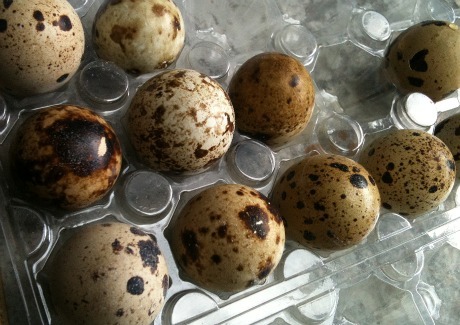 Quail eggs can be had at many grocery stores and in Chinatown, and have the added bonus of keeping for months on end. Their thin shells are complemented with a thick membrane, so cracking them can be a trick–I’ve found that long thumbnails help a lot to break through the membrane, and even then, they can sometimes end up pre-scrambled. But when you can get them out whole, fry the quail eggs in butter for just a few moments–they’re so small they cook in a blink. They’re adorable on tiny toasts, or make your own breakfast sliders with tea biscuits, rounds of summer sausage and horizontally sliced Baby Bel cheese. Eight quail eggs is a breakfast appetizer for four.